The bad guys--don't they look despicable? 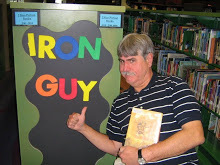 Hey and middle-of-July greetings from the Iron Guy to all the reader guys out there. Summer is really rockin' at the library. We have lots of cool programs at the Myers park library like the Story Explorers on Monday nights and the Tuesday at Two programs. (check out more info here) In fact, we had a great one last Saturday. It was the fourth meeting of the Boys Read and Write Club and we had a really great time. There was a new guy there and his name was Winnux. He likes graphic novels and he checked out a couple--but more about that in a minute. As always, we start with a fun activity. This time we did something inspired by the great Lunch Lady graphic novels. There were 4 bad guys trying to sneak into the school. Winnux had to use his Slotted Spoon Launcher to stop them by using Mustard Packet Grenades and Sour Cream Bombs. If he missed, the bad guys got closer. Even though they tried over and over, our hero bravely beat them back! Our schoolkids can rest safely now, knowing they are in the hands of heroes like Lunch Lady and Winnux! After our fun, we had some snacks and talked about our favorite graphic novels. Winnux checked out a couple, as you see here--a Lego Chima (The Power of Fire Chi) and an Oh Yeah Comics! graphic novel. These look really good. I can't wait to hear what you think of them, Winnux! Write to us and let us know. Winnux and his graphic novels--good choices! In the meantime, enjoy the summer, keep cool and keep reading! Our Second Review from Winnux! Our First Review from Winnux! Our First Review from Walden!